Drunken Saints "Pubmosphere", The Shillelaghs "Bury Me at Sea" and Ebri Knight "Foc!" 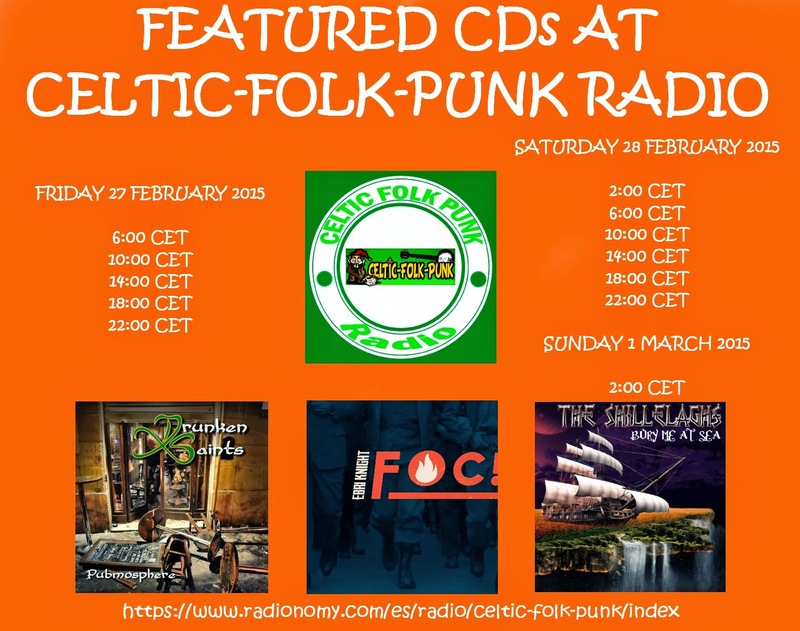 are the featured CDs at Celtic-Folk-Punk Radio. Albert Avilés - Bass, bodhrán. Songs from More Power to Your Elbow "Until the Last Note Fades", Mick O'Toole "1665 Pitchfork Rebellion", LochNesz "Leave the Captain Behind" and Green Ashes "Sean" will be played too. 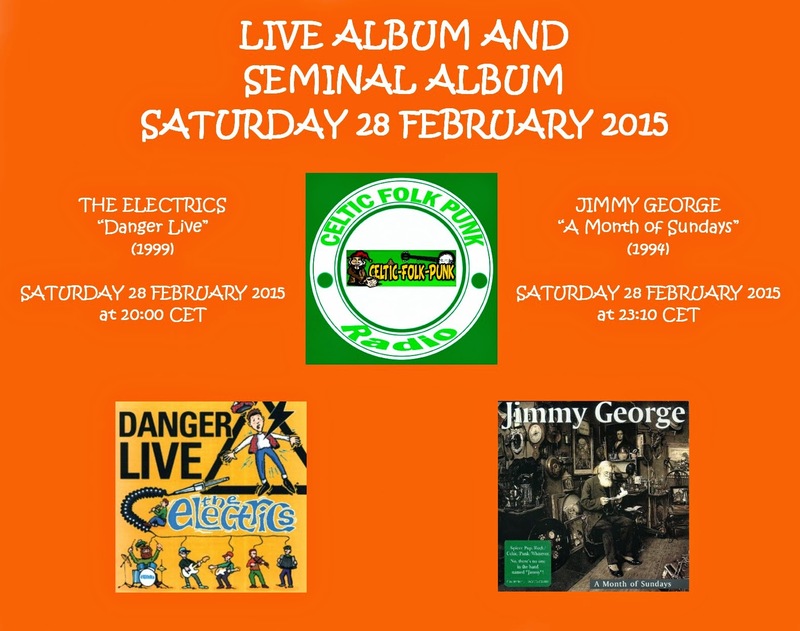 The Electrics are a Celtic rock band from Dumbarton, Scotland. They formed in 1988 when former Infrapenny members Sammy Horner (vocals and bass guitar) and Paul Baird (guitar) asked drummer Dave McArthur and sax/keyboard player Allan Hewitt to play a gig at Glasgow's Impact Festival. The band released a self-financed cassette album, Views in Blues, in 1989. Following this recording the band evolved a celtic rock sound, heavily influenced by The Waterboys and The Pogues. Subsequent recordings included Vision and Dreams (1990) which was distributed by Word Records, and Big Silent World (1993), on Germany's Pila Music label. Renowned for their energetic performances, the band have performed in the UK, Europe and the USA. The band have not officially disbanded but have no plans to play any shows in the near future; Sam Horner is currently a church based youth worker in Canada, while the rest of the band members, past and present, remain in Scotland working on other projects. Paul Baird - Guitar and backing vocals. Davie McArthur - Drums, Bodhran. Allan Hewitt - Keyboards, accordion, saxophone, whistle and backing vocals. Heather Negus - Accordion, keyboards. Kenny MacNicol - Highland/ Uhllean Pipes, whistles. 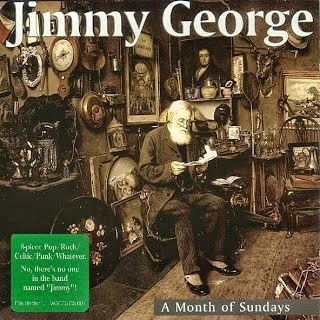 Jimmy George is a Canadian folk rock band, who blended Celtic folk with rock influences in a manner similar to Spirit of the West and Great Big Sea. Formed in Ottawa in 1991, the original lineup consisted of Michael Lawson electric guitar, Joel Carlson mandolin, Steve Barry (vocals), Duncan Gillis (acoustic guitar/penny whistle), Rob Porter (drums), Michael Eady (fiddle) and Colin Burns (bass). Various members came and left over the subsequent years. The band at the end of their 9-year run as house band at the Duke of Somerset pub consisted of vocalist and guitarist J. Todd, electric guitarist Steve Donnelly, bassist George Jennings, Joel Carlson on mandolin, Jeff Kerr on banjo, Mickey Vallee on accordion, and Tom Werbowetski on drums. Other members at various times included Eric Altman (drums, played drums live and on all Jimmy George recordings), Christine Chesser (fiddle, vocals - Chickpea), and Vitas Paukstitis (bass). In 1993, after establishing a reputation for a dynamic live show, the band was asked to open for Spirit of the West in Peterborough and Ottawa. At the Peterborough show, the band arrived and the sound man asked "which one of you is Jimmy?" The band was told they couldn't use any of Spirit of the West's equipment and that they would have to pare down the band for the show as there wasn't enough space, time or channels on the board for an 8-member band as the opener. The band was ready to leave when Spirit of the West singer John Mann intervened and said the band was welcome to use any of their equipment if it made things easier. The show went off without a hitch. The next night in Ottawa, the band again opened for SOTW in front of a capacity crowd at Carleton University's Porter Hall. At this show Bill Stunt, producer of CBC Radio's All In A Day program, was in the crowd and approached the band after the show. Stunt offered to record the band's material using funding from the CBC development budget. Over the next few months the songs were honed and recorded at Ottawa's Sound of One Hand studio, and A Month of Sundays was released on Montreal's (now-defunct) Cargo Records later that year with national distribution by MCA Records. Two years later the band released their follow-up record Hotel Motel, produced by Marty Jones and the band and also recorded at Sound of One Hand and Raven Street Studios. In 2001 on the occasion of another reunion show at Barrymore's Music Hall in Ottawa, the band released the CD "Same Sh!t Different Day", a collection of their favourite songs from their previous releases, plus a few songs recorded live including the previously unreleased song "Where You Bleed". The band toured Canada from coast to coast twice and also played occasional shows in the US including Colgate University in Hamilton, NY and a private function in Detroit, MI. Most of the band also visited England and Ireland for a month, busking in the streets of London and Dublin and seeing the sights. Venues of note include the Town Pump (Vancouver), Amigo's (Saskatoon), The Rivoli, Horseshoe, and Ultrasound (Toronto), Sidetrack Cafe (Edmonton), Town House (Sudbury), Barrymore's Music Hall and Zaphod Beeblebrox (Ottawa) and countless more. The band played for many years as the house band at the basement Duke of Somerset pub (now closed) in downtown Ottawa every Sunday night and one weekend a month, regaling the crowd with their music and antics. The band played over 500 shows at the Duke of Somerset over a 9-year period including several St. Patrick's Days and New Year's Eves. Often touring bands would stop by "The Duke" to join the band for a few songs or borrow their instruments and play a few tunes and have a pint. Great Big Sea made several such appearances at the Duke on Sunday nights, as did some members of Leahy who also played The Duke on a regular basis. The band have ceased recording and playing as a unit for the most part, playing a "final" show in 1997. They played regular "reunion" shows in Ottawa to celebrate St. Patrick's Day or over the Christmas holidays for several years. In April, 2002 the band headlined Ottawa's Tulip Festival Concert Series and played a headlining show at Ottawa's Barrymore's Music Hall, flying in accordion player Mickey Vallee for the occasion from his new home of Edmonton, Alberta. October 7, 2007, the former owners and staff of the Duke of Somerset pub organized a reunion event at local pub The Heart and Crown. Jimmy George played two sets with the line-up of J (vocals/acoustic guitar), Jeff (banjo), Mike (electric guitar), Joel (mandolin/bass), Rob (drums), Steve (bass/mandolin/accordion) and guest appearances by Angela McFall (Fairytale of New York) and Madeleine Giguere (Rock and Roll Thing) on vocals and Colin Burns on bass for a few songs. March 17, 2008, the band played a St. Patrick's Day show at Zaphod Beeblebrox in Ottawa. The lineup for this show consisted of J Todd (vocals, acoustic guitar), Joel Carlson (mandolin), Rob Porter (drums), Steve Donnelly (bass, electric guitar, accordion) and Colin Burns (bass on a few songs). This show was likely the smallest version of Jimmy George to ever perform live. In December 2011 the band celebrated their 20th anniversary with 3 shows at Kaffe 1870 (Wakefield QC) and Elmdale House Tavern (Ottawa ON). Altman flew in from Japan for the occasion, and Vallee made the trek from western Canada. The band played to packed houses 3 nights in a row and the second night featured all three drummers from the band's history, Altman, founding member Rob Porter and Tom Werbowetski. Several of the band's songs have been performed by other bands, most notably Breakfast With St. Swithin which appeared on Vancouver band The Town Pants' CD. Other bands have performed the band's Token Celtic Drinking Song despite the fact that the song has no official lyrics and many of the words are improvised and undiscernable even on the recorded version. The band's songs have been featured in several television programs including Toddlers and Tiaras, and Southie Rules. Three years and 34156 pints later, this is what we have to show for ourselves. The Jimmy George Credo: if you are not completely satisfied with this product, you should lower your expectations.